World Wide Fund China designated Oct. 27 as International Panda Day on Friday in Shanghai, hailing the global integrated conservation efforts of the bamboo-munching, black-and-white bear as an example to be followed in protecting other wild species. "Hope is the biggest meaning of International Panda Day," said Lu Siping, the CEO of WWF China, at the launch ceremony. "That hope will promote the society and people to protect other species." Lu said that the giant panda, which has been WWF's logo since its establishment in 1961, is also a symbol of the global conservation movement. The achievements they've made in the past decades make people believe that the environment can be improved and rare species can be saved by integrated efforts. As one of the largest independent nongovernmental environmental protection organizations, WWF started to protect the giant panda in 1980 when the Wolong National Nature Reserve in Sichuan province was established. At that time, the population of the black-and-white bear had reached an estimated low of fewer than 1,000 due to poaching and deforestation. Ever since, WWF has been working with the government on initiatives to save the rare species and its habitat, including helping to establish an integrated network of giant panda reserves and wildlife corridors to connect isolated panda populations as well as working with local communities to develop sustainable livelihoods and minimize their impact on the forests. Decades of intensive conservation efforts have seen the number of panda reserves jump to 67 and the area of protected forests reach 2.58 million hectares. 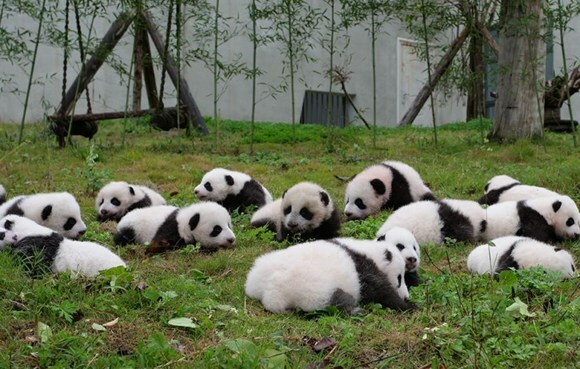 The population of the wild panda gradually rebounded, jumping to 1,864 in 2014 from 1,596 in 2004. As a result, the International Union for Conservation of Nature downgraded the animal from being "endangered" to "vulnerable" in 2016. The WWF celebrated the panda's reclassification, saying it proved that aggressive investment does pay off "when science, political will and engagement of local communities come together". Despite the achievement, Lu said threats to the giant panda's survival and reproduction remain. "The biggest threat to the giant panda is habitat fragmentation," Lu said. "We are trying to build corridors to connect natural reserves to reduce the impact of human activities such as infrastructure projects." WWF China now has more than 110 employees and eight local offices. While the organization will continue its efforts to preserve the giant panda, it also focuses on projects to preserve other endangered species, such as the Eastern gorilla and the Yangtze finless porpoise, among others. Lu said the establishment of International Panda Day can serve as a reminder of what can be achieved through integrated efforts from all walks of life, home and abroad. During the recently concluded 19th National Congress of the Communist Party of China, General Secretary Xi Jinping announced the country's determination to return 2 percent of the land to nature. "It is very impressive to hear Xi's proposal on protecting the environment and we will continue to help the government to achieve ideal harmony in the environment," Lu said.